It’s always reassuring to scrutinize a vehicle’s price invoice (called a Monroney Sticker) and discover that absolutely NO extras have been added to inflate the base figure. 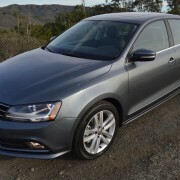 In this case, $26,995 is what you will pay for a very fully equipped Volkswagen four-door sedan. This tidy, tight little package is a lot of fun to drive. 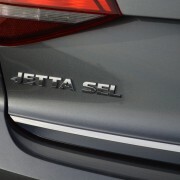 Best of all, it’s so fully equipped in SEL Premium form that you can enjoy this Jetta without so much as adding a single extra cost option. 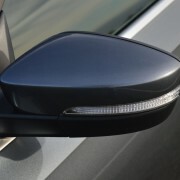 Try performing that parlor trick the next time you step into an Audi, BMW or Mercedes dealership. In addition, VW has been taking such a beating over the last 18 months for its diesel malfeasance that dealers are hungry to move 2017 Jettas at attractive price points. 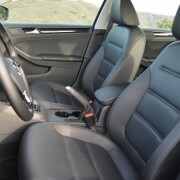 Among the extras here that you won’t pay extra for are: a rearview camera, a dual zone HVAC system, a keyless push button starter, blind-spot monitor with rear cross-traffic alert, app-connect smart phone integration, navigation and Fender infotainment system, bi-Xenon headlights, rain-sensing wipers with heated nozzles, and a power sliding/tilting sunroof. 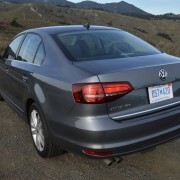 Of course all those standard niceties wouldn’t mean so much if the basic architecture of the Jetta inhibited driving fun. Such is not the case, however, because like most V Dubs of yore, even this rather inconspicuous, decidedly family-oriented sedan has its driving chops down cold. 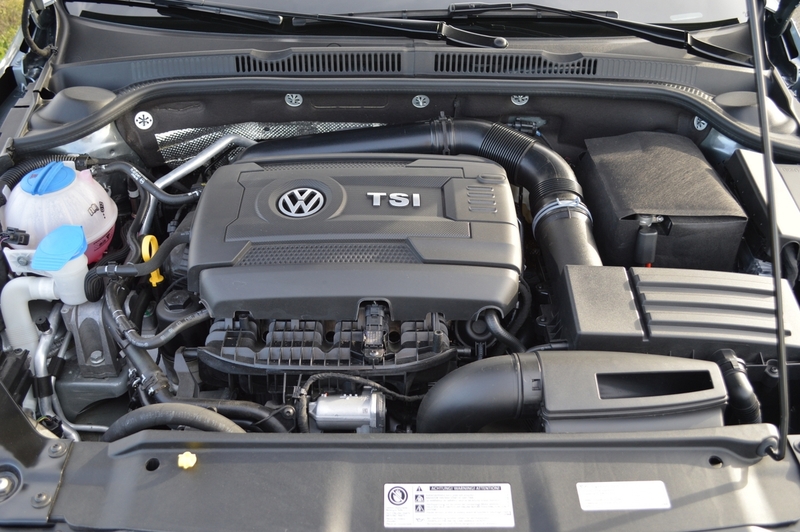 Tucked sideways under the hood is the VW organization’s go-to powerplant, a 4 cylinder turbocharged 1.8 liter motor making 170hp and 184lb.-ft. of torque. 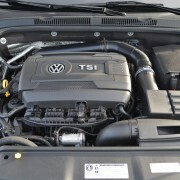 Other versions of the Jetta can be had with a 1.4 liter turbo (150hp) or a GLI Jetta with a 210hp 2.0 liter turbo 4. 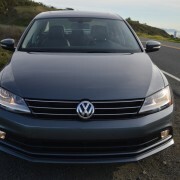 Our test Jetta, finished in a spectacularly flaky metallic shade called Platinum Gray, bolted a 6-speed automatic gearbox complete with paddle shift controls, to the 1.8 liter Direct Fuel Injection engine. 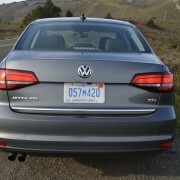 The engine of this “German” Jetta is built in Mexico while its transmission is imported from Japan. 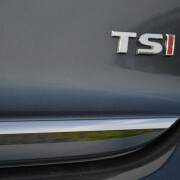 Performance with the mid-range Turbo and the automatic is always sprightly since the Jetta weighs just 3,040 lbs, giving it a sporting power-to-weight ratio of 17.8 lbs./hp. 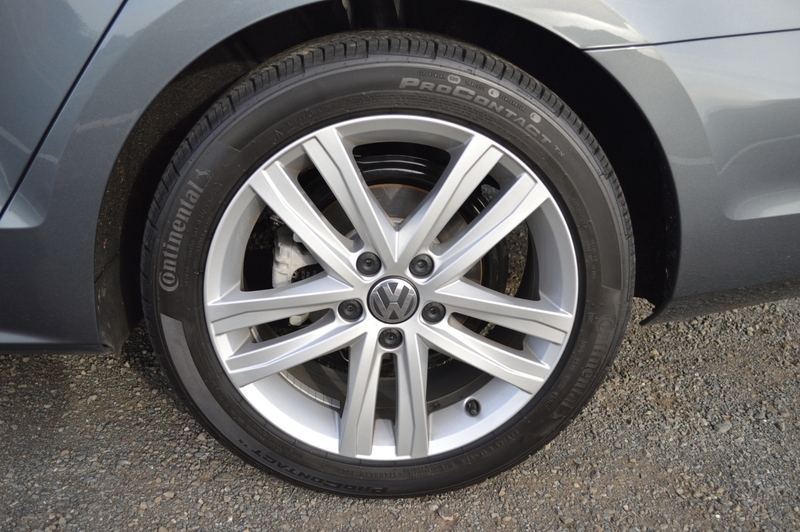 Standard fare also extends to the Jetta’s alloy 17 inch rims shod with premium 45 series Continental Pro Contact tires which put 225 mm of all-weather rubber at each contact patch. 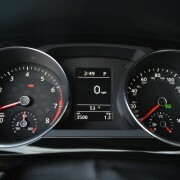 A standard tire pressure monitoring system keeps track of the air in your Continentals. 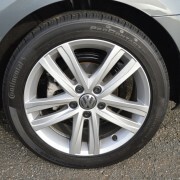 Despite their short sidewalls, the Conti Sport Contacts afford more than a modicum of ride comfort to passengers. 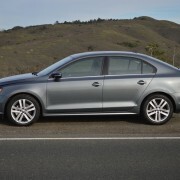 Along with a well modulated suspension system, these tires keep the interior of the Jetta quiet, comfortable and unperturbed even when traversing the nastiest bits of broken pavement. 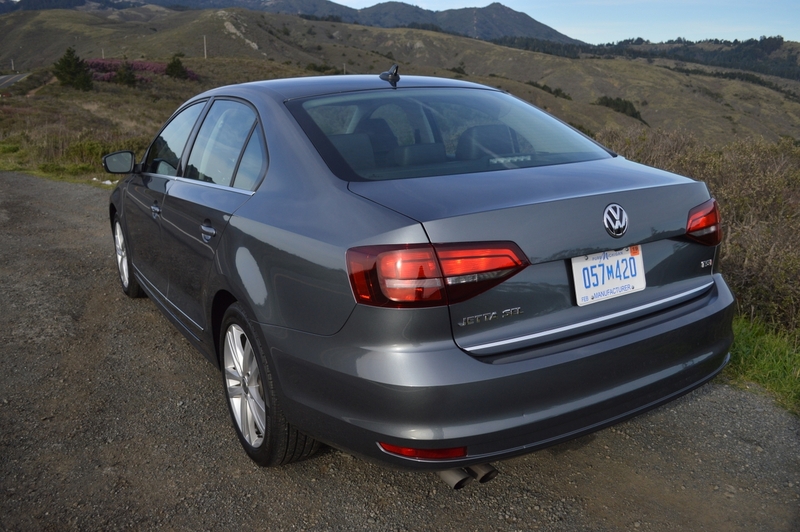 With its spacious back seat, slouchy-comfortable front seats, and airy cabin windows, the Jetta constitutes a pretty fair substitute for a living room on wheels. The 54.5 inches of front shoulder room and 53 inches of rear shoulder room make for a spacious conversation pit. The 16 cubic foot trunk keeps a foursome’s possessions neatly stowed out of sight. At one point during our week with the car, a trio of occupants found this VW so comfortable after a drive that we all sat together chatting for over an hour without ever feeling like we needed to climb out of the Jetta. Volkswagens have always had a way of ingratiating themselves into your life like that. Pretty soon, they become trusted members of your family. That kind of reasoning keeps loyal customers coming back to this marque for one generation of VW after another. There aren’t many automotive refuges where you can still find solid German engineering and driving pleasure at a price that makes you double-check the Monroney Sticker to make sure you read it right the first time. 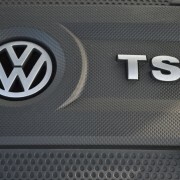 Other German manufacturers wonder how VW can turn the trick for the money they charge. 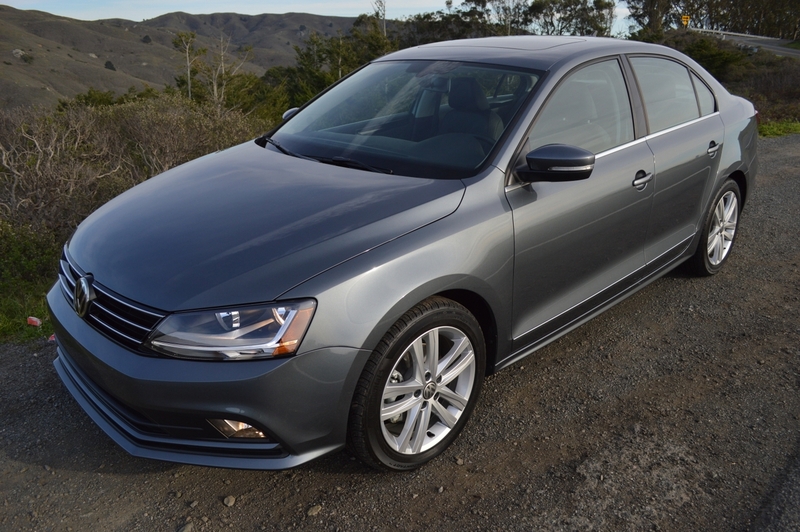 If you can live without the needless burden of a chic nameplate, but still seek the best that German style motoring has to offer, take a close look at the loaded 2017 Jetta SEL Premium.